With the release of The Horus Heresy – Betrayal at Calth, we’re introduced to the 31st Millennium of the Games Workshop’s Warhammer 40,000 universe. While some of us are busy assembling our miniatures, our interns here at Games @ PI are already painting the miniatures up for a store demo! In our recent poll on our Facebook page, you guys have voted for the Iron Warriors and the Imperial Fists to be the rival legions painted by the store, so without further ado, let’s hear from our interns, Kew Sheng Yao, and Mokan s/o Yoganathan! Painting, the way of making things look pretty and outstanding. Most people say it’s costly as you need to buy a huge range of colours and tools which are not cheap. That’s what I understand about painting, but there are others who disagree with this statement. So in order to decide for myself, I’ve decided to try it using the recently release game called The Horus Heresy : Betrayal at Calth. In this game, where will be miniature where they are required to be assembled and painted with colour representing the faction. After the community voting, the decision has been made. The battle will be between pre-heresy Iron Warriors and pre-heresy Imperial Fist. I’ve done a few Gundam assembly before that makes me think that building the miniature should not be a problem but of course, never jump to conclusion so early. After looking at the models of the game, I notice something different about it. If you look closely at the model, you will notice that there are no gaps and clips to hold the model. Instead, you are require to use a special glue to make sure that the parts are holding each other. 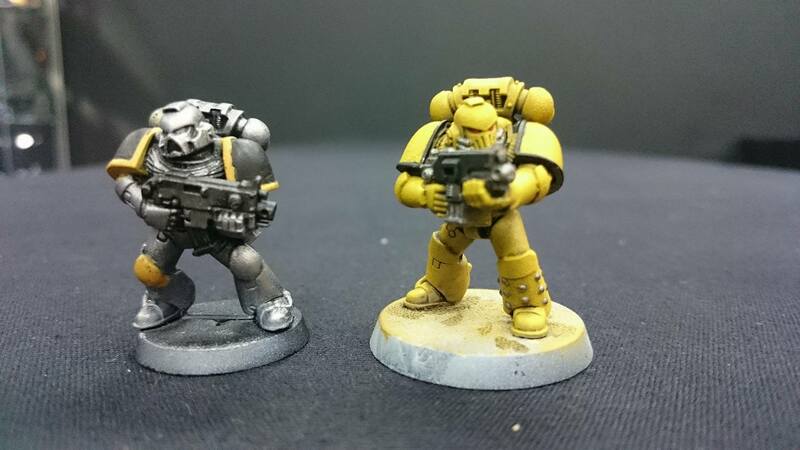 The moment I noticed it, I was like telling myself ‘oh my god, this is a whole new level of building model and painting.’ In the end, I’ve decided to paint pre-heresy imperial fist and my friend Mokan will paint pre-heresy Iron Warriors. Just let everyone one know, this is my first time having to assembly a model using glue and paint it. I shall start painting the model soon! Hi all, I am here to prove how easy painting is , and how do I prove it. Well I will take the challenge on myself. I will be painting the pre-heresy Iron Warrior models. With no prior experience of any kind, I had no idea where to start at. Luckily for me, one of my superiors, who is also well versed with painting miniature models decided to help me out by conducting a 10 minutes tutorial. He taught me how to do dry brushing and application of base coat for the miniature models. Besides demonstrating how to do the techniques he also let me have a go at it. Using one of his painted model as a reference, I started off doing another model from scratch (already primed black). I put to use the technique that I just learnt about like dry brushing and application of base colour. I spent about 20 to 25 minutes to complete a model, which is significantly longer compared to any other amateur painters. The longer working time was mainly due to my inexperience and mistakes that happened. After somewhat completing the model, I am satisfied with the overall look of it. I felt dry brushing was easy to do and require very little skill or experience. However applying the base colour was challenging. One factor was the mixing of water with the base colour. I had the problem of mixing too much water that made the paint feel too “runny” and not “smooth” anymore. Another factor was the handling of the brush itself. Being relatively new I had trouble with doing straight strokes and often tend to overlap into other area, which in turn cause me to redo the layer again. Otherwise I had a good time getting used to painting miniature models. Apologies, folks. Duty called and I ended up spending the past couple of weeks in holed up somewhere near Lim Chu Kang. But enough about me. You’re here for the games. 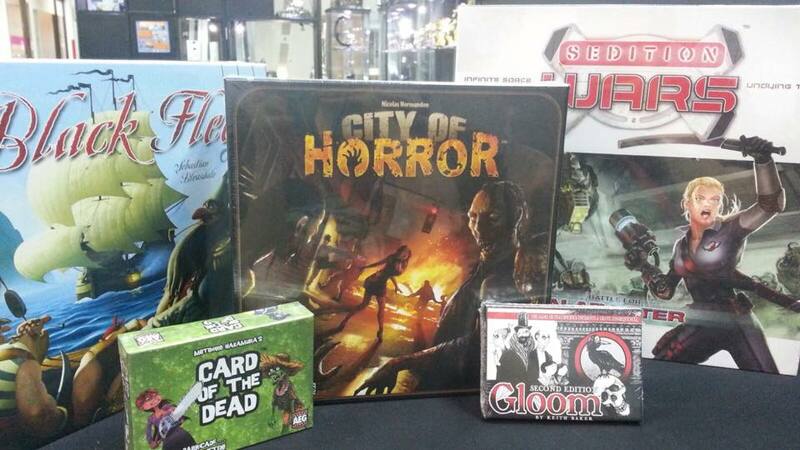 We’ve got our usual spread of new stuff, and all those Splendor, Ticket to Ride and Dixit restocks you’ve been waiting for. Alternatively described as a gripping co-operative game of supernatural deduction and a “game of ghosts, murder and hilarious incompetence“, in Mysterium, players are alternately Mediums attempting to grapple with cryptic clues from a haunting as they attempt to solve a murder, or a Ghost who is increasingly frustrated by the inability of the Mediums to follow his instructions. Will the murder be solved before the harried Ghost player has an aneurysm and collapses? In Shakespeare, players are theater managers who must recruit actors, craftsmen, jewelers and others in order to assemble everything needed for the play’s performance at week’s end. Each day players recruit one new character and take actions with the characters they have. After the actions, they must check the ambience level in their theater, hoping to gain gaining points and rehearsal time. Players must juggle the balance between earning revenue to pay their actors and at the same time ensure the artistry of their plays to maintain their credibility. The Audience has spoken – in the Room 25 Season 2 expansion for the claustrophobic Room 25 survival game, new arrivals have been tossed into the labyrinthine survival game – and the existing cast has gotten all new power boosts. Of course, the complex hasn’t stayed the same either, and the players will have to face more hazards and traps in their bid for survival. Are you ready for the Betrayal at Calth? 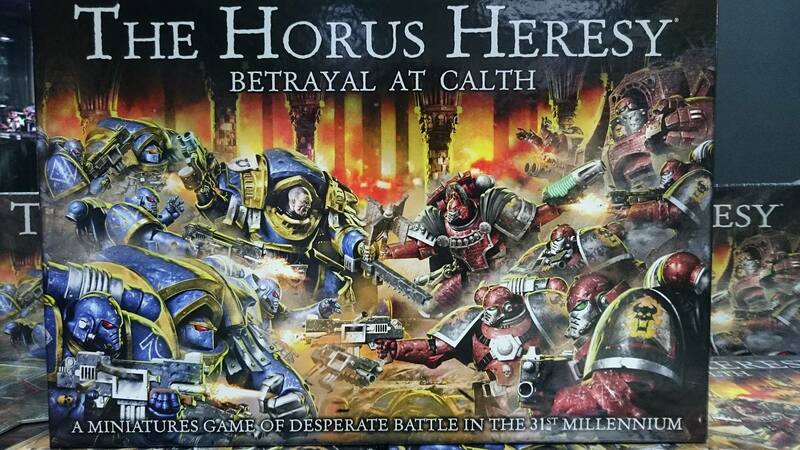 Do not forget that The Horus Heresy Betrayal at Calth will be up for sale tomorrow. Have you participated in our poll to determine what the Legion rivalry should Games @ PI paint up for our store demo? Don’t worry, we’re closing the poll tonight! So head over to cast your vote! What are you waiting for? Cast your vote here! Sales for The Horus Heresy Betrayal at Calth commences tomorrow. Don’t forget to come over to our store to pick up your copy (or copies)! It’s still the month of the Tau for fans of Warhammer 40,000! 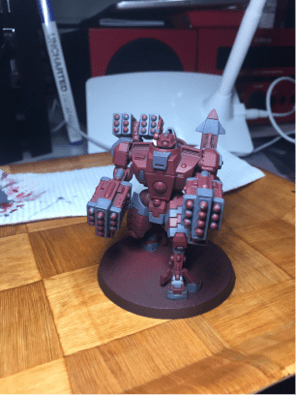 To prove that anyone can paint tabletop quality models, our staff, Dale, decided to take on the challenge to speed paint (and assemble) the fantastic Tau XV88 Broadside Battlesuit just a couple of days ago. Without further ado, lets dive into the makings of! 8:00 PM: I pried open a box of the XV88 Broadside Battlesuit. Looking at the components inside, there doesn’t seem to be many. This should be fairly doable. 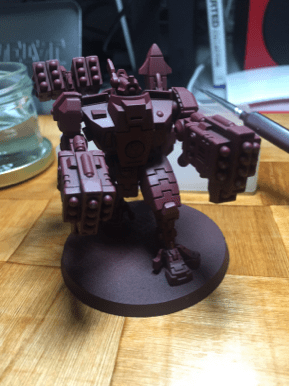 8:38 PM: Seems like the XV88 Broadside Battlesuit is now online! I finished building it with the options that I wanted. As expected, it wasn’t all that challenging. Took me longer than anticipated as I was managing the Netrunner League as well. 8:42 PM: Joe offered to help with the undercoat (or priming of the model) since I was busy with the League. 8:49 PM: The undercoating is done! Now the only problem is waiting for it to dry and cure. 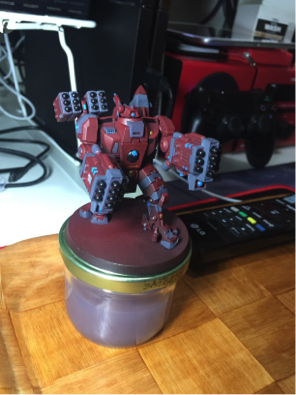 Joe offered to help with the base coating of red, as I wanted this XV88 Broadside Battlesuit to be part of the Farsight Enclave. 9:16 PM: The base coat of red is completed! Joe did a pretty even base coat with the airbrush, which sped things up significantly. I decided to bring it home for further painting of the details. The base coat is done. 23:42 PM: Supper needs to be dealt with first before painting. Instant ramen looks fantastic. 0120 AM: Food coma happened. Finally decided to start on painting. Will begin with the major colours. 0147 AM: The grey areas now done. They were done carefully so I don’t have much to touch up on later. Greys are done! Looks better now. 0150 AM: Decided to take quick break. Tuned in to Netflix for some background noise while I prepare to work on the minor colours and detailing. 0352 AM: Still working on the details and such while watching “Parks and Recreation”. 0405 AM: And I’m done. It’s way past bed time. Time for me to turn in. More models can be completed in the days to come. And it’s done! All that remains is to put it on the table and play! TLDR: Total time taken for a pretty basic tabletop ready paint job? Around 3 hours, that includes assembly and not loafing around. 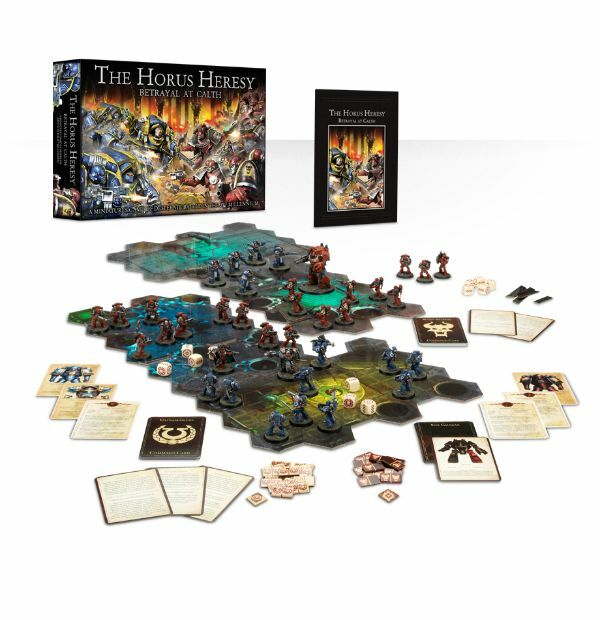 Games @ PI will be taking in pre-orders for Games Workshop’s The Horus Heresy: Betrayal at Calth board game! The retail price will be at SGD$228.00 before discounts. What are you waiting for? Whether you’re a Loyalist or a Traitor, you should be making your orders with us! Fancy yourself a chance at a 25% discount off a single item from our store? Look no further! Join us in our Hunt for Cypher Painting Contest! The theme of the contest revolves around your interpretation of Games Workshop’s Warhammer 40,000 character, Cypher. The model you would like to work on does not have to specifically be an Dark Angels Infantry Space Marine. You’re free to use your creative engine to reimagine Cypher! Perhaps he could be an Ork in a parallel universe, or even actually ascending to a Daemon Prince! So what’s required of you? 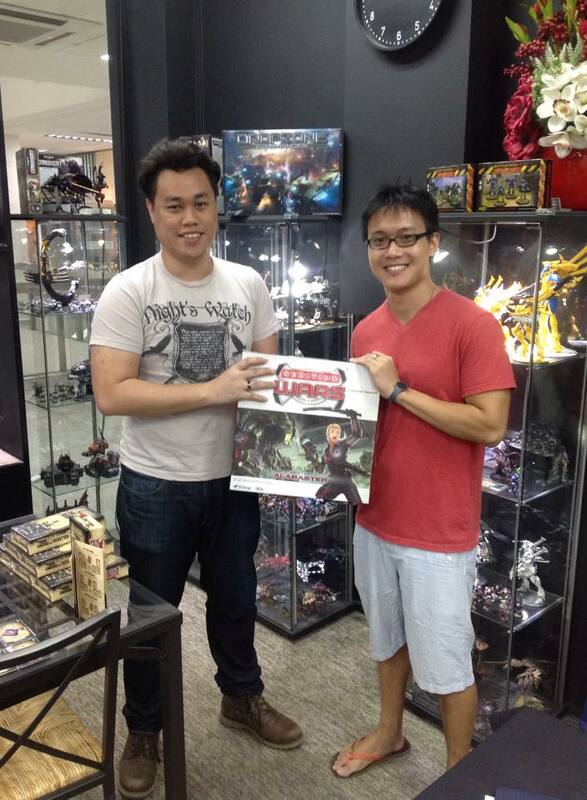 The entry fee to the contest is SGD$10.00, although you’ll be given a $6 Dollar Voucher Dice to be used in our store. The deadline for registration is November 27th, 2015. Participants are also encouraged to post a Work-In-Progress update to our Facebook page with #huntforcypher; participants that post at least two updates will receive one PI Store Dice. Results will be announced on December 25th, 2015. Two winners will be picked by staff voting, as well as public voting in the store during the period of December 19th till December 24th, 2015. Each winner will get an incredible 25% discount of any single item in the store! If you have any queries regarding the contest, feel free to drop by our store, or contact us through our website! *Disclaimer: Terms and Conditions apply, Games @ PI reserves the right to amend the terms and conditions of this contest from time to time at its sole discretion. The Ghastly Giveaway promotion is over! Halloween is now over and we’ve picked our prize winners! The following are the lucky winners of our Halloween Ghastly Giveaway! Congratulations to our lucky winners! Kindly contact us so we know that you’ll be collecting your prize! For those that have already collected their goodies, once again, congratulations! And here’s our lucky winner of the top prize, Sedition Wars! Congratulations, Maurice Quek! We hope you like your copy of Sedition Wars! *Disclaimer: All prize winners have till this Sunday, November 8th, 2015 to confirm that they are collecting their prize. In the spirit of fairness, failure to respond by this Sunday will result in Games @ PI allocating the prize to another person; the re-draw will take place on Sunday, November 8th, 2015. Happy Halloween, everyone! We’re doubling your odds at winning! 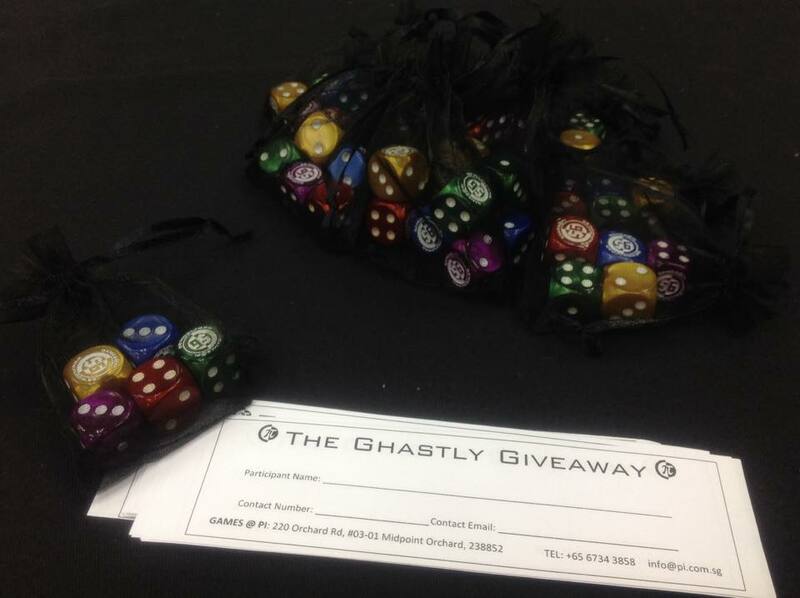 Hey folks, we would like remind you that The Ghastly Giveaway is still on going! Just a gentle reminder still, for every $60 that you spend with us in a single receipt will net you a $6 Voucher Dice, however, there’s a twist! For TODAY only, you’ll be getting TWO lucky draw tickets instead of one. Here’s a little teaser for the prizes that you’ll stand a chance to win.. Happy Halloween! And may the odds be ever in your favour! 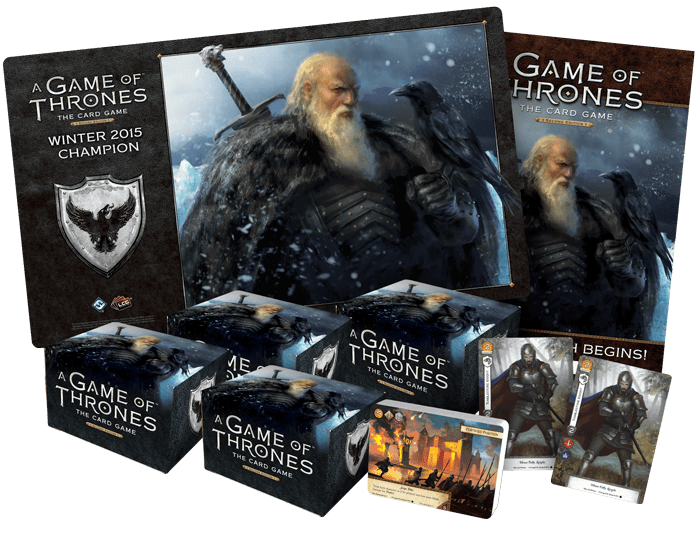 Games @ PI is launching the Kingslayer event for Fantasy Flight Games’ A Game of Thrones: The Card Game on November 3rd, 2015 at 7 pm. So what is Kingslayer? You are limited to one core set. Your deck must consist of minimally 10 neutral cards. The maximum number of duplicates for a card in the main deck is THREE copies. Your plot deck will consist of SEVEN plot cards; duplicate plot cards are limited to TWO copies. The Kingslayer format rules will not be different from the normal Melee rules, however, we will be imposing a time limit of 70 minutes. This is to ensure that the event ends on time. So what’s in it for you? We’re glad you’ve asked. You will stand a chance to win yourself some glorious loot from Fantasy Flight Games’ Game Night Kit*. Valar Dohaeris, we will be expecting you. *Disclaimer: Pending kit production. We will notify winners if there has been a delay in the arrival of the prize kits. Games @ PI reserves the right to replace prize support in the event of the manufacturer being unable to to supply the prize kits. Contact our staff for further details. It’s release day and we’ve got the goods, so it’s time to make the Run. Tune your decks with the bleeding edge of technology with the new Data and Destiny Expansion, or embrace the return of a modern classic with the all new edition of Fury of Dracula. Stalk the ageless count across Europe in your struggle to end his deathless rampage in this all new edition of the two to five player game of misdirection. Mislead your hunters and lose their pursuit as Dracula, or find the count and stake him during the day when he’s helpless as a Hunter and Decide once and for all whether Europe will fall under the undead Count’s terrible influence. It’s time to face destiny.